This Overnight Pancake Casserole makes having pancakes for breakfast even easier! With a crunchy crumb topping and easy overnight rest, all you have to do to get this on the table is wake up and pop them in the oven! Who loves waking up before the sun rises to prepare a special breakfast for your family? Any one? Any one? Ok, a few of you weirdos might get an odd thrill from waking up when it’s still dark out. I’m happy for you. Really, I am. Your early morning zeal is enviable. For the rest of us, 5 AM is a number we’d like to avoid at all costs. We roll out of bed at the last possible second, fumble around trying to make a decent cup of coffee and ask ourselves (yet again) why we didn’t go to bed an hour earlier the night before. 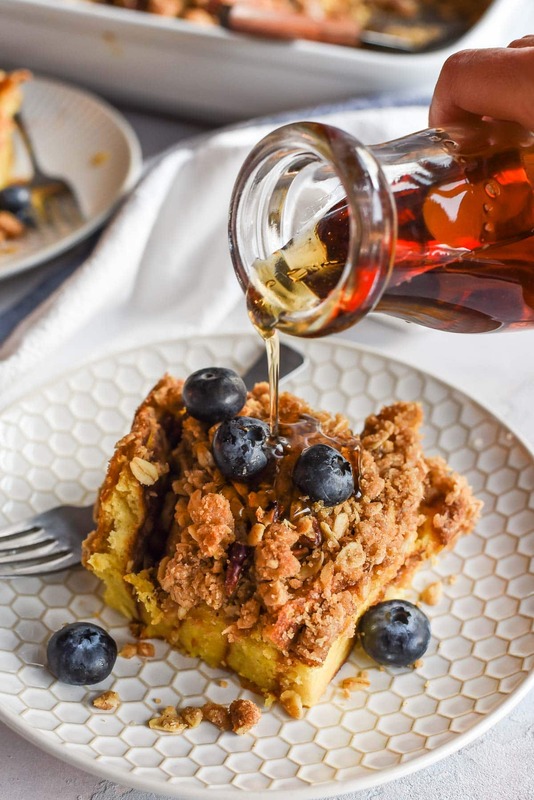 Of course, that doesn’t mean we don’t love making a delicious breakfast for our loved ones. It just means we’d prefer to do that without sacrificing that extra hour or two under the covers. Enter: Overnight Pancake Casserole. For all of you who love sleep, but also love hosting brunch, this recipe is going to be your new best friend. Every little piece of this casserole is made in advance. It can even be assembled weeks ahead and frozen (insert all the praise hands)! 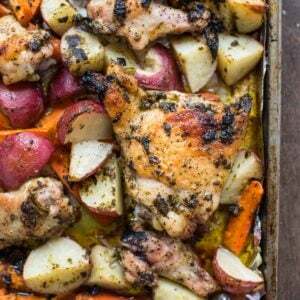 All you have to do in the morning is stumble out of bed, preheat the oven, and manage to lift the casserole from the fridge to the stove. After that, you’ve got a precious 45 minutes to putz around the house, sip the coffee you somehow managed to prepare, brush your teeth, and maybe even take a shower…if you’re really feeling ambitious. Of course, the ease of making this recipe isn’t the only thing it has going for it. It’s also unbelievably delicious. Everything starts with my favorite Perfect Fluffy Buttermilk Pancakes. These pancakes get their fluffiness from a very simple secret: a separated egg. It really makes all the difference! You can, of course, substitute your own favorite pancake recipe, but I really recommend you give these a try. They might just become your new favorites. The casserole requires about 2o medium size pancakes, so you’ll likely need to make a full batch, but if you happened to WAY overestimate how many pancakes you’d need for an event, or if you like to freeze extra pancakes, this is a great way to use up the leftovers! The pancakes are halved and layered in a casserole dish before being drenched in a mixture of milk, cream, eggs, and vanilla. 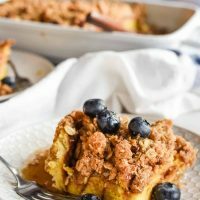 You may recognize this technique from my overnight apple French toast casserole. 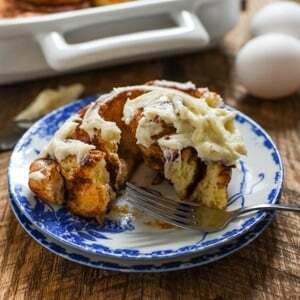 Soaking the pancakes overnight in the egg mixture results in the rich, custardy texture these casseroles are known for! After soaking overnight, the pancakes are piled high with a cinnamon, pecan, and oat streusel. Now, a slight disclaimer on the streusel: As a mega fan of crumb toppings, I loved the thick layer of crunchy crumbs, but my husband preferred less crumbs on his. Feel free to make adjustments based on your own tastes, and if you’d like, you can halve the ingredients for the topping. This dish would be a lovely surprise for Valentine’s Day or Easter morning, and could also be an excellent breakfast-in-bed offering for Mother’s Day. 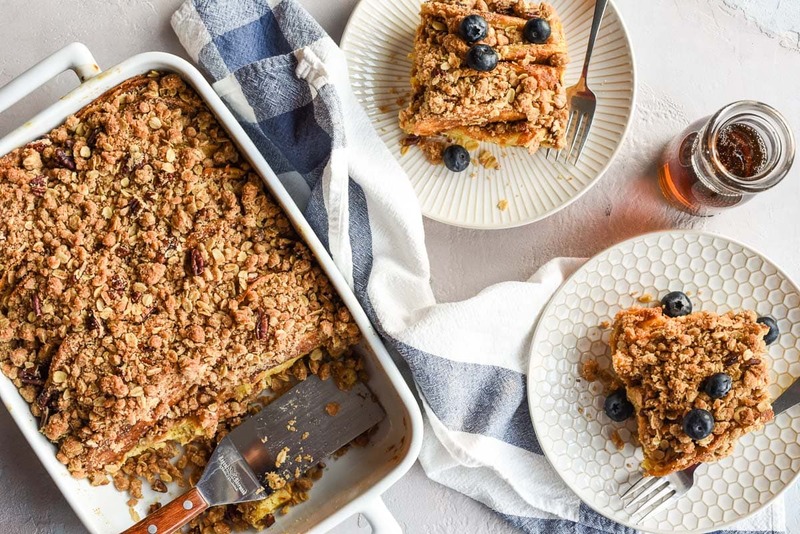 Keep this one around for lazy weekend brunches. All of my fellow bleary-eyed sleepy heads will thank me. Did you know when you bake with eggs there’s a good chance you’re getting them from my home state of Ohio? Ohio is one of the largest egg farming states in the nation. Ohio’s egg farmers are proud to provide safe, healthy, and affordable eggs to consumers, while also protecting the environment for future generations. If you’d like to learn more about egg farming, visit OhioEggs.com, or get a virtual tour of the Lochtefeld family farm. 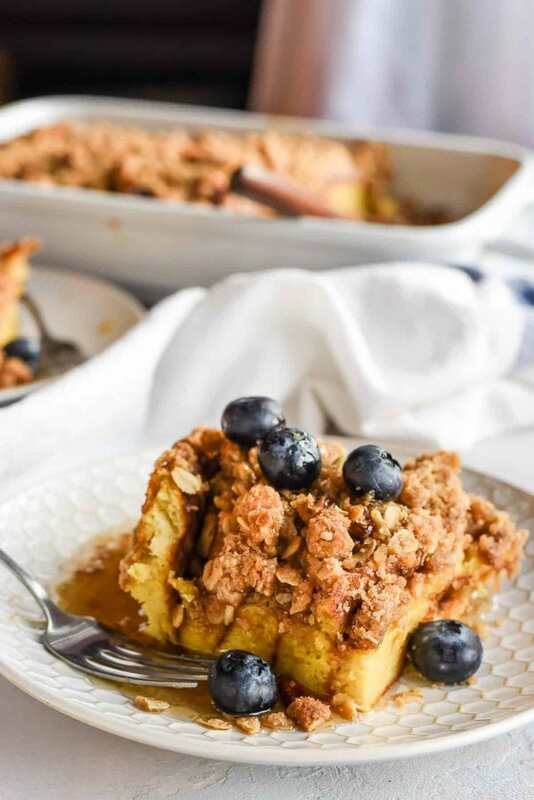 This Overnight Pancake Casserole combines fluffy buttermilk pancakes with a rich egg custard and crispy cinnamon streusel topping. Heat a griddle over medium heat and cover with a thin layer of neutral oil. In a medium bowl, whisk together flour, sugar, salt, soda, and baking powder. In another medium bowl, lightly beat the egg yolks, then whisk in the butter, buttermilk, and milk. Add the buttermilk mixture to the dry mixture and stir gently until barely combined. Add lightly beaten egg whites to the mixture and gently stir until a thick, lumpy bumpy batter forms. Stop before the batter smooths out. Lumpy batter is good! Drop quarter cups of batter onto the preheated pan. Cook until bubbles start to appear on the exposed surface of the pancake. When bubbles appear, flip pancake and cook for an additional 2-3 minutes or until browned. Remove to a wire rack and allow to cool. Repeat with remaining batter. Butter a 9 x 13 inch casserole dish. Cut the pancakes in half (you should have around 20), and layer them cut side down in the pancake dish. In a large bowl whisk together the eggs, milk, cream, vanilla, and sugar. Pour evenly over the pancakes. Cover with saran wrap and refrigerate pancakes overnight. In the morning, preheat the oven to 350 degrees. Whisk together the flour, oats, pecans (optional), brown sugar, salt, and cinnamon. Pour the melted butter over top and stir. Use your fingers to work the mixture until crumbs form. (Note: You can do this step the night before, and store it in a bowl in the refrigerator if you prefer.) Pour the crumbs evenly over the top and bake for 45-50 minutes or until the crumbs are browned and center is set. You can use any pancakes for this recipe, though I’ve included my favorite recipe here. You’ll need about 20 pancakes for the casserole. My husband prefers less crumb topping on this, but I prefer more. This recipe reflects my own tastes, but feel free to halve the crumb recipe if you prefer less. At what point would this be frozen? Immediately after assembly or after it has soaked overnight. When baking from the frozen state would you have to thaw first? I haven’t frozen this before, but I think you could pour the egg mixture on top then freeze. (Don’t let it rest overnight first). You could also put the topping in a baggie in the freezer. I would thaw in the fridge overnight before baking.